2011: The route of the line was cut through to provide this temporary crossing between Albert Road (on the left) and Factory Road (on the right). There was another crossing just short of the old North Woolwich station as well. Original fencing that could be opened to allow trains across Factory Road. The line runs parallel with Factory Road from left to right. One of the goods tracks still embedded in the tarmac of Factory Road between North Woolwich and Silvertown. Footbridge over the track. It was permanently closed on 18th July 2011 and has now been demolished. Photo from 1979 looking from the above footbridge back toward Silvertown. (Copyright photo by Tom Burnham from his Flickr site. Used with permission). 2006 westward view from the above footbridge of a North London Line train en route to Silvertown and beyond. The aforementioned Factory Road is on the left; the south side of the railway. Move your cursor over the image to see the same view in July 2011. Photo taken from a virtually identical place as the three photos above, albeit from the top of a bus (because the bridge has been removed). Factory Road is still on the left, behind the fencing, and Albert Road is behind the fencing on the right. At the time of this photo, both roads were having renewal works carried out on them and so the road traffic was diverted onto this temporary road, constructed on the former track alignment. 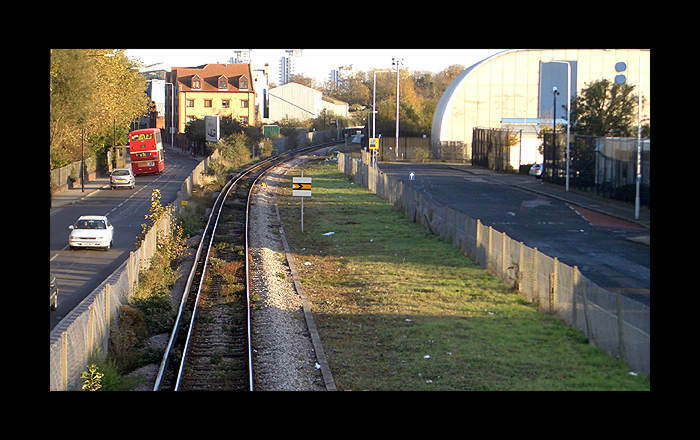 Looking toward North Woolwich station from the aforementioned footbridge in 2005. The platform area of the station can just be made out. A new housing block and warehouse on the left and the odd-shaped building on the right are both built on part of the once expansive platform and goods area. Move your cursor over the image to see the same view in 2011. Aside from that, this is the area that the Crossrail tunnel portal on the north side of the Thames will be built. 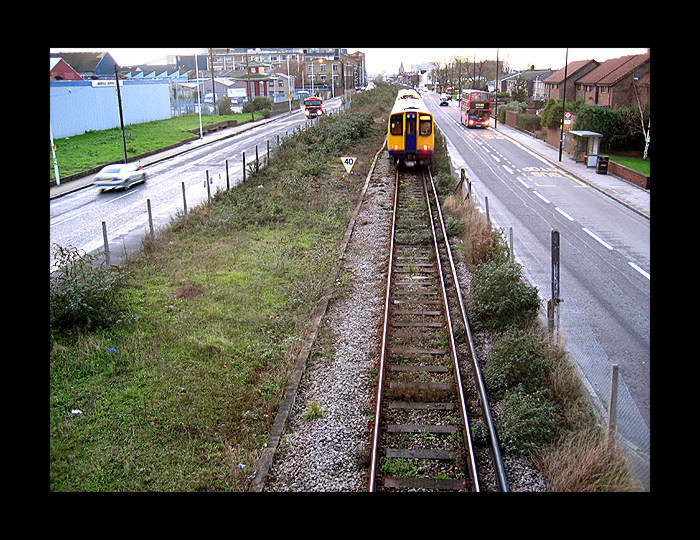 The line will start its descent into tunnel at a point roughly where the old bridge was and will be completely in tunnel before reaching the old North Woolwich station location. The route will continue under the river to Woolwich and Abbey Wood. 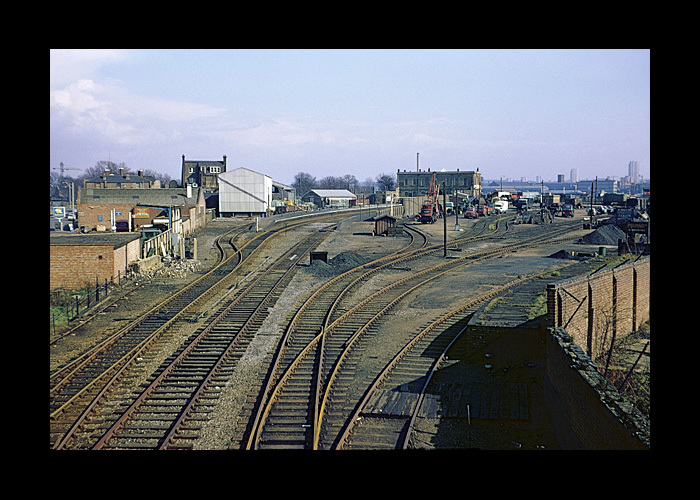 Illustrating just how localities can change over time; this is the approach to North Woolwich and the overall layout of the site, in April 1970, taken from the other footbridge closer to the station. 1- the northern island platform. 2- The southern platform. This was the one that was in use toward the end of the station's life. London Railways by Edwin Course. B T Batsford Ltd, London, 1962. London's Local Railways by Alan A. Jackson. Capital Transport Publishing, Middlesex, 1999.